Somehow I've gone 33 years without making tater tots. Don't ask me how that's possible. It's just the way it is. It's not that I'm opposed to them, but if I'm going the potato route, fries are what often call to me. I'm happy to announce, however, that I'm on "Team Tots" now. Or should I say #teamtots? Are hashtags still in? 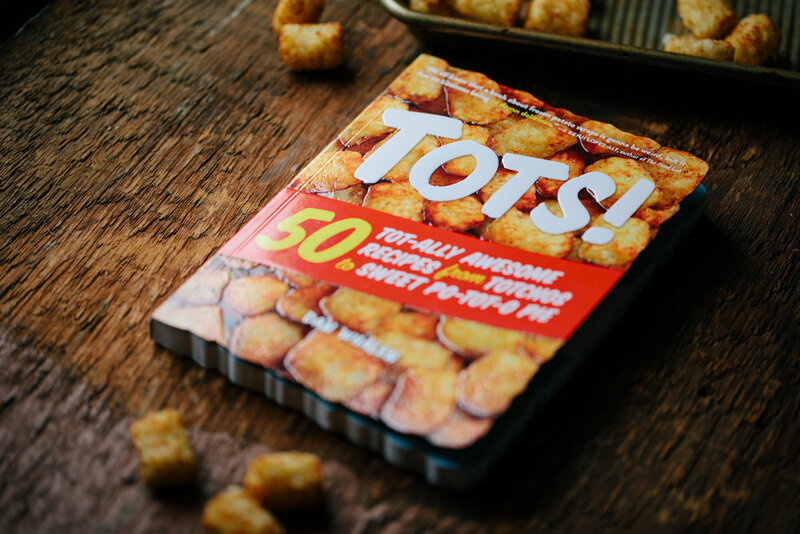 My friend Dan isn't just a blogger, cookbook author, and TV star (he won Guy's Grocery Games last year), but he is king of tots. He's so into them, in fact, that he's written a book featuring fifty creative ways to use them. I decided to give my first go at a spuddy dish with this bowl of my favorite spring-time vegetables. Potatoes and mushrooms and fiddleheads and ramps. What more could one ask for? Bring a pot of salted water to a boil. Add fiddleheads and cook for 8 minutes. While they're cooking, prepare a bowl of ice water. Using a slotted spoon, transfer fiddleheads to the bowl to shock them. After a few minutes, drain all the water from the bowl and set fiddleheads aside. In a saute pan, melt the butter over medium-high heat. Add garlic and cook for 30 seconds. Add mushrooms and ramps and cook, stirring occasionally, for 3 minutes. Add fiddleheads and cook for another 5 minutes. Pour in lemon juice. Season with salt and black pepper, to taste, as well as most of the rosemary, leaving a little for garnish. Preheat oven to 425 degrees F. Line a baking sheet with aluminum foil. Lightly coat with cooking oil and spread tots on top in an even layer. Bake in the oven for 24-26 minutes, until golden brown. Transfer tots and cooked spring vegetables to serving bowl and mix together. Garnish with remaining chopped rosemary. Since the beginning of April, our weekends have been consumed by trips to the Cape. We're getting close to the end of the major work. The main bathroom has been gutted, which is probably our biggest obstacle at this point. There are a few exterior elements... an outdoor shower that's being constructed and some painting... that remain. It's both exciting and slightly overwhelming. But that's home ownership, right? I decided to take this past weekend off, opting to stay home and get projects finished up and some cooking done. I've taken a much longer hiatus from the blog than I'd intended, but I have a few things lined up these next couple of weeks. I'm starting off with a bowl of Moroccan spiced carrots and lentils. While it feels very fall, this is a year-round dish... and an excellent side for an outdoor feast. It's savory and sweet with a hit of acidity from the citrusy dressing. I've eaten plenty of it on its own, but it certainly feels like the perfect pairing for a platter of grilled chicken or fish. Bring 1 1/2 cups of water to a boil in a medium pot. Add the lentils and turn the heat down to medium, letting it simmer for 20-25 minutes, until cooked (but not mushy). Drain of any remaining liquid. Transfer lentils to a serving bowl to let cool. Preheat oven to 400 degrees F. Line a large baking sheet with aluminum foil. In a small bowl, whisk together the cumin, cinnamon, garlic powder, onion powder, paprika, and 1/2 teaspoon salt. Add the carrots to a separate bowl and toss with 2 teaspoons olive oil, followed by the spice mix. Spread carrots over the prepared baking pan and transfer to the oven. Cook for 30 minutes, giving the carrots a stir halfway through. While the carrots are cooking, heat 2 teaspoons olive oil in a pan set over medium-high heat. Cook the onion for 3 minutes, stirring occasionally. Transfer onion to the serving bowl with the lentils. Prepare the dressing by whisking together the lemon juice, 2 tablespoons olive oil, chopped dill, 1/2 teaspoon salt, 1/4 teaspoon black pepper in a large mixing bowl. Pour over the lentils and onion and carefully stir to combine, making sure not to mash up the lentils. Once the carrots have finished cooking, carefully toss them with the lentils, along with the currants. Season with salt, to taste. Garnish with chopped parsley. Serve warm or at room temp.